emmatree: everyday sunday: april 6. rain and no chocolate. everyday sunday: april 6. rain and no chocolate. me on the temporary bridge. i stood there watching the water rise and then scooted off. our back yard is surrounded by other back yards, all higher than ours, and water pours from the old rock walls like waterfalls. the water rushing down the street, pushed against the curbs, curls in the air before splashing down, and i think waterhorses, though in truth i have no idea what waterhorses are, unless you count the ones in lord of the rings. thunder. the rock bridge crossing the creek by my front door floods quickly, and i mistake the sound of hard falling rain for hail. the waterhorses deepen and rise and i begin to see the creek rise also. no way can i resist stepping into it and over it. where do you write about the weeks that tear your heart and push you to your knees in pain and love and too-much-ness? do you find a pen and a notebook and a light in the darkness and write until your hands cry no mas no mas? do you search for a warm spot in the sunlight, wear sunglasses against the brightness, write a sentence, stop and search the sky, write another sentence, or maybe just a word, lean back and close your eyes, give it up for right then, put it off, lean further back, put the pen down? do you leave voice messages for yourself, swearing you'll write them down later, sighs and pauses and all, promising yourself you'll remember the way you looked off to the side when you said this, that you'll not forget your jittery heart as you said that? do you prop the computer in your lap and just type the words, listening to the rhythm of the keys, not seeing the words as anything but letters and apostrophes, just letting them drain from your fingertips? do you sit at a desk with the tv on and too bright lights overhead because it's what you do and where you do it, and the sound of kids and sitcoms is just white noise? do you pay attention or do you try to not look? seeing the story written down is hard for me. the words never cleanse, never release. sometimes i begin a sentence and then turn the page. too much, too much. this morning's storm saved me; blue legal pad in hand, ditto my favorite pen, the yowling cat driving me crazy, my knee aching - i wanted the words to tear through the paper, break on through to the other side, but it wasn't happening. my ankle began to ache. my hip. my head. the cat grew crazier, wanting outside, but not really. i let my breakfast grow cold. the words too. my hand began to ache. the news disturbs me. the thought police have arrived, and i think to myself there is no longer any use in writing the truth, in being honest; the water is rising and the bridge we are standing on will fall. i think i will not reach to save those who let it rise, but i know myself and i know i will. i take soup from the freezer to let it defrost, and the cat, at last calm, falls asleep in front of the fire. i buy a book on kindle - on sale, something to read through the rainy afternoon. i wonder how anyone who owns a stove can complain about cooking. i wish there was chocolate in the house, and decide to head to the store as soon as i finish this post. earlier there were birds in the rain, flying sideways, fast seeking shelter of the trees. and then the skies opened up. now there is thunder in the distance and the rain has slowed to almost nothing. i see a robin on the grass across the street. it feels like an all-clear sign. I can relate to so much in this post. 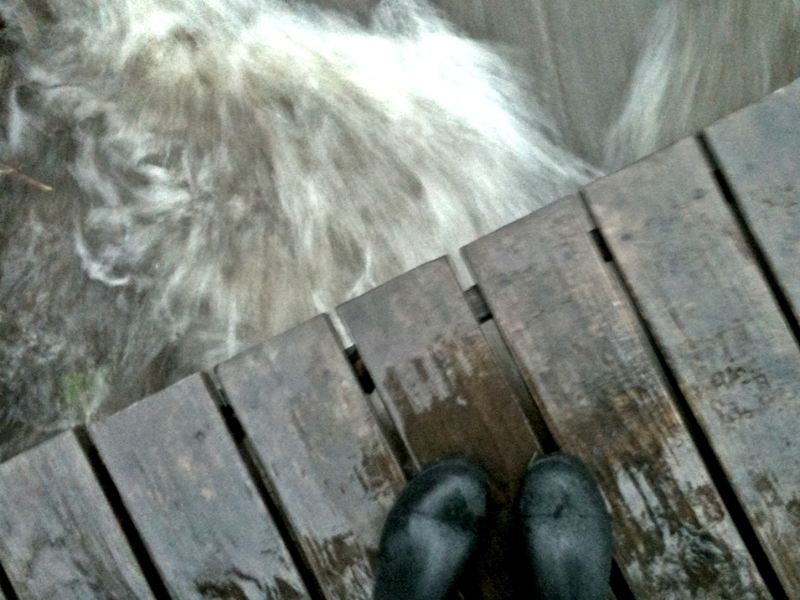 Especially I feel as you do about the rising water, the breaking bridge. Yes, the thought police are here. So much we don't dare say. In all my craziness lately, I missed this. But I'm glad I found it just now, we all need an all-clear sign every so often, one that keeps us moving forward. The "where do you write" paragraph carried me home. I do all those things, there are no rules, no rights, no wrongs, no bridges that take us farther away than our own backyard. But we watch that water swirl and it takes us somewhere else just the same. It's the fact that we keep showing up that matters.